After listening to book 1, I got the 1-3 bundle. That's how much I enjoyed book 1! I enjoyed watching this world unfold and it's interesting and varied characters come to life. I also enjoyed finding plot twists that I didn't see coming. 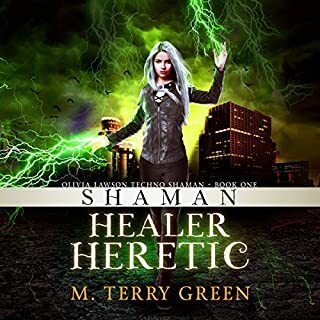 What was one of the most memorable moments of Shaman, Healer, Heretic? I enjoyed the full journey of learning about Olivia and her friends, rather than one specific moment or two. Celia Aurora de Blas is a talented narrator I am happy to now know about. She has a pleasant, straightforward narration style with well-differentiated character voices. I believe it would make an excellent TV series, rather than a movie. 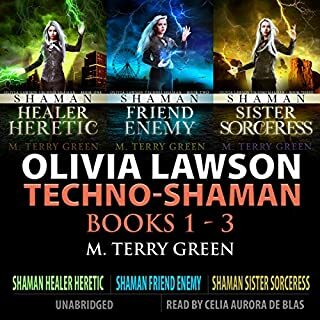 The tag line would either be "Techno Shaman Olivia Lawson: Setting the World Right" or "Olivia Lawson: Techno Shaman, Healer, Heroine."